We've arrived at that time of the week again where I share with you the products that I used most in the last seven days. My week was msrked by travelling back and forth to school, physical therapy and taking care of a lot of things before I go into surgery. I also got a new laptop so hopefully I can get back to daily posting! Mentioned in yesterday's review was the Aesop Primrose Facial Hydrating Cream, my latest addition to the ever growing skin care collection. This cream is a gorgeous mix of oils that delivers long lasting deep hydration while feeling light on the skin. It easily absorbs and does a great job underneath my favorite foundations. 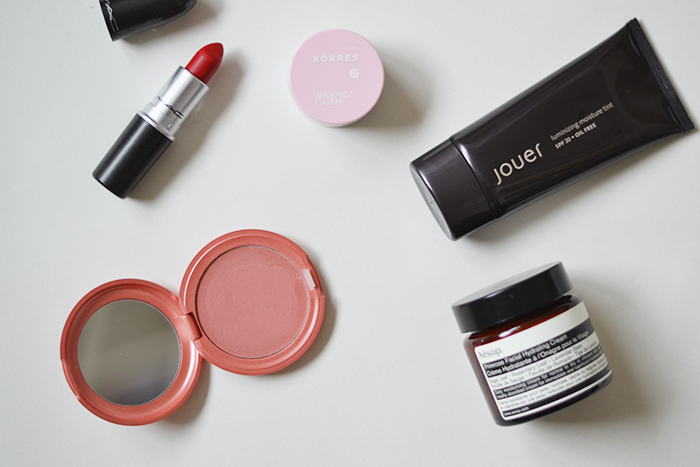 Which brings me to the next favorite; Jouer's Luminizing Moisture Tint. This light coverage glow giver has been mentioned in favorites in the past but it has been the only foundation I have worn this week. I love how it still looks fresh and dewy even after hours of wear. As an addition to that gorgeous glowing base I have been using the Stila Convertible Color in Lilium. A more detailed review will be posted later next week. But I can say now that this is the perfect one swipe blush if you're looking for that hint of color. It's really subtle and it works with most lipstick shades. Not one but two lip products are featured this week. 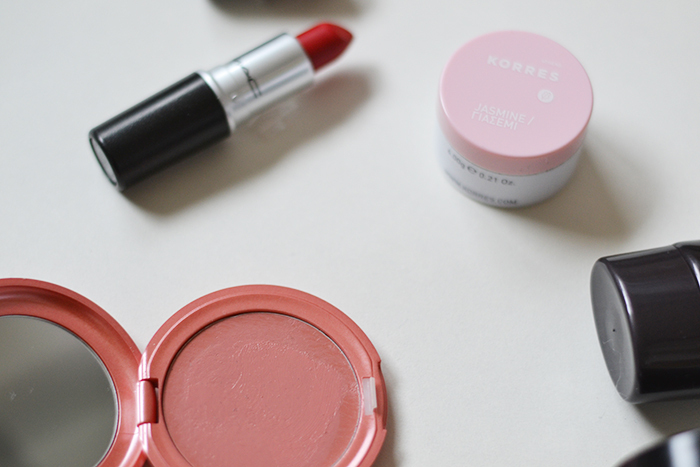 I've been keeping my pucker moisturized with the gorgeous Korres Lip Butter in Jasmine on the days that I don't wear lipstick, it has just a hint of color but the best part of it is the amazingly smooth feeling it gives to your lips. It melts when it comes in contact with your skin and keeps your lips hydrated and plump for hours on end. A hero product for sure. On the days that I did wear lipstick I was only wearing MAC Ruby Woo. This gorgeous deep red shade adds such interest to an otherwise boring makeup look. It's become my favorite lipstick, and I think everyone should try it! Those were the five favorite products of my week, what have you been loving lately?